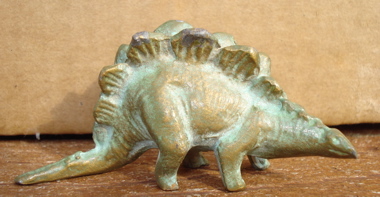 The SRG Stegosaurus is a dream among Dinosaur Toys. 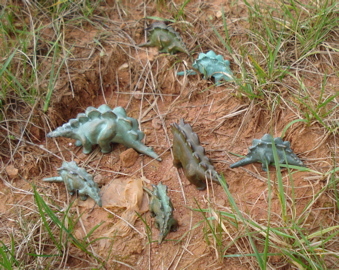 The SRG Stegosaurus Dinosaur toys were not my favorite as a child. There was nothing terribly exciting about him. While he was great for my T-Rex to attack, the Tyrannosaur invariably took more damage than its prey. That should have told me something. Over the years I have come to appreciate this sculpting a whole lot more. 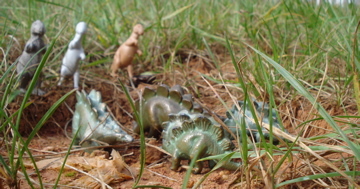 Its form truly conveys that of the Stegosaurus in a minimalist fashion, as well as offering action in its pose. Weighing in at three and five-eighth ounces (3 & 5/8 oz.) and measuring three inches (3"- 77mm) from nose to tail the smaller is still quite the hefty little fellow. The tops of his armor plates tower to ~an inch and a half (1.5"- 45mm). This is NOT simply a smaller version of the large as it is in both a 'mirror image' pose and actually has greater detail, such as compression of the skin across the rib cage. The spikes are a bit sparse, but if they were longer they probably would have been broken off by now. His tail was particularly vulnerable. 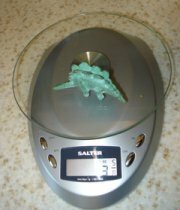 The large SRG Stegosaurus weighs thirteen and five-eighth ounce (13 & 5/8 oz) which takes him from 'hefty' directly to heavy. At approximately five inches (5"- 113cm) in length and two inches (2"-5cm) in height it is physically not that much bigger than its little brother but it is a lot more massive. Its tail spikes are more pronounced as well. These are both very, very nice figures and look great on a shelf or a desk. 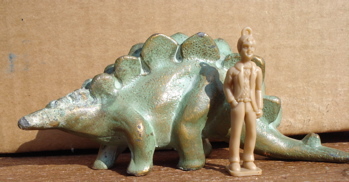 In the small size the weight of the hollow Stegosaurus is three ounces (3 oz), only five eighths of an ounce less than the solid. 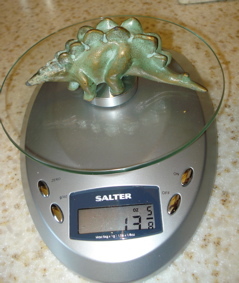 I do not know what the weight difference is for the large Stegosaurus Dinosaur figure. 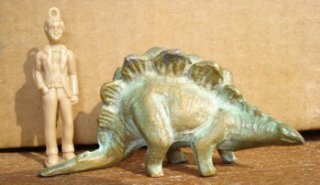 We know that there weren't any grasses in the Jurassic Period so the SRG Stegosaurus, despite the comparatively low carriage of his head, was not a grazer. Since he was a herbivore the conclusion is that he was a browser, nibbling on bushes and the low branches of what passed for trees at the time. His rear legs were significantly longer than his front and it is suggested that he could rear up, giving access to branches as much as twenty feet up in the air. While no one is sure of what the plates on his back were for- survey says: defense, body temperature control or sexual display (there is even discussion about how they were placed). There is no doubt but that the tail spikes served for defense. There is an Allosaur leg wound into which a Stegosaur spike fits perfectly. 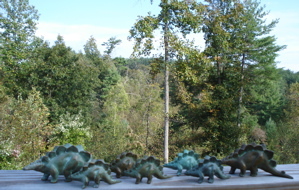 What Do SRG Stegosaurus Dinosaur toys Do All Day? Well, the first thing to do is to simply gather the herd and head on out, into the great outdoors.... It's a pretty day and there are good things to eat. ...and when they get too aggressive the herd huddles for self-defense. ...and then time to go home. 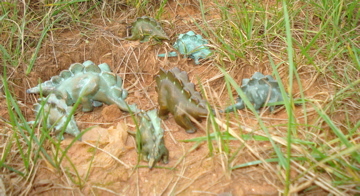 The SRG Stegosaurus Dinosaur toys are, to my eye, the best looking of the SRG Dinosaur line-up. 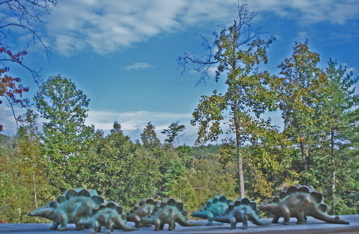 Their form just flows and they sing (la la la) "Stegosaurus" to me. The large one is more ponderous while the small has runway model good looks. My advice: If you can find a pair... get a pair. 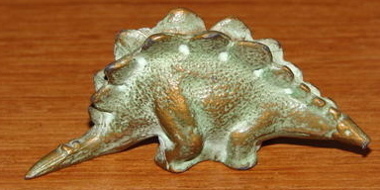 The SRG Stegosaurus is part of a larger set that can be found by clicking on its name. 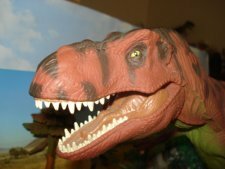 If you are interested in other Dino-toy companies' Stegosaurs or in collecting Dinosaur toys in general this site, The Dinosaur Toys Collectors Guide is made for you.